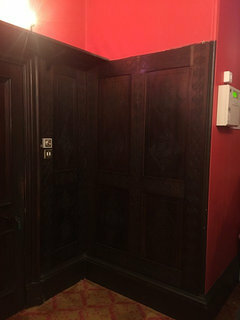 Hi - the panelling in the hallway of our 1875 Victorian gothic home is very dark and topped off with red paint. To say the hall is an intense experience is an understatement. The wood is quite intricately carved and has had lots of layers of what looks like varnish. We have investigated under the carpet and we have a parquet floor that we want to restore. Anyone got any ideas? Are you wanting to keep that look or go completely different? Could you try stripping the varnish off the panelling on a section that’s not that visible? 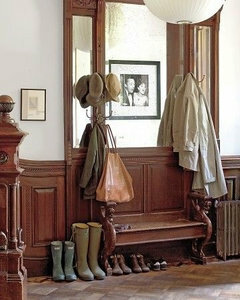 Lightening up the panelling, painting the walls and revealing the parquet would totally change the space. If you want to keep the dark colour to the varnish you could lighten the paint above and stain the parquet you’ve found a similar colour to the panelling. Final option you could paint the panelling white and either go dark light on the parquet and a dramatic deep paint colour above. I know some people are against painting original panelling though! I wonder if rather than strip you could take it darker, more like a black or smoked oak with a varnish or stain. It would look amazing with a pale/medium parquet flooring. Maybe it’s just the red paint and carpet accentuating the redness of the panels. Perhaps taking up the carpet and painting the walls could help you decide what to do with the panels. As the room seems to be a reception area for a hotel, you will need to consider the issue of it being a high traffic area. The dark wood is coping well with knocks from suitcases on the stairs and children’s fingerprints etc, and paint may not! Replacing the flooring to be a lighter shade and using lighter paint colour will allow more light to reflect in the space. Also updating the decor on the shelves would help. The dark padded reception area also requires replacement to make it more of a feature and far more welcoming. As this is the reception for your business, first impressions are really going to matter and the standard of finish needs to be high. It also needs to reflect the building and the decor of the rooms. A very trendy reception will jar with more traditional surroundings. It's a beautiful space! I am not sure I would recommend painting as the process to get it looking smooth would not be an easy one...and the ongoing maintenance. I love the dark panelling but would pair it with lighter flooring (the parquet in a natural finish would be lovely) and would consider a light/white paint colour on the walls as well to really contrast with the dark varnish. 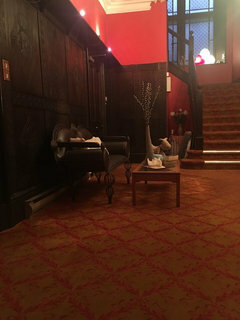 Then you could add the highland-type colours with art, high wearing area rugs, and stair runners. Good luck! What a fun space to revamp! Love Danielle's idea of going darker with light walls and a pale parquet floor, stunning. 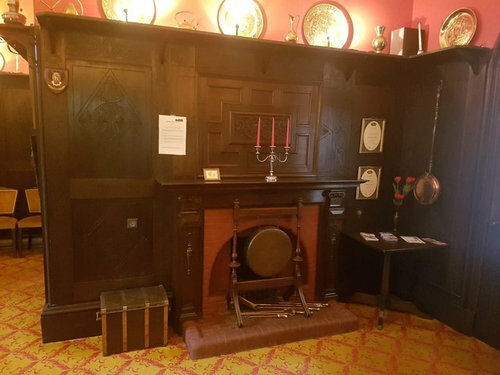 I love panelling and I think you could paint out the red in a pale shade (Farrow & Ball do lovely period colours) and leave the panelling as it is (as per first pic below) or you could paint all of the panelling too as per the other pics. I don’t think you need to remove all the varnish off the panelling, a light sand and a couple of coats of primer followed by 2 top coats should do it. How amazing will that look? Thanks everyone - I am thinking of Farrow and Ball “pigeon” - it’s a grey/green shade and not too intense. I have taken on board all the comments about the floor. I think once the carpet goes we will see the real space. 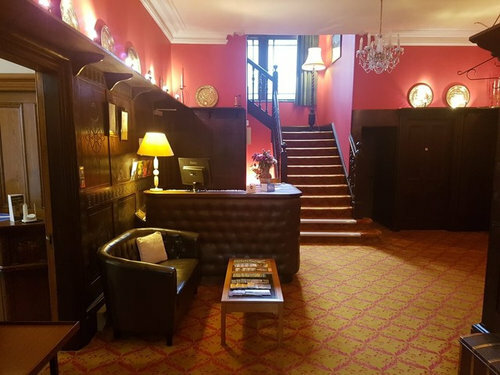 I’ll check out the other hotel - we were in The Fife Arms in Braemar (spying ) and they have done a fabulous renovation but I don’t think my budget would stretch to a Picasso and a Feud in the reception rooms. But it’s worth checking out their website. It’s a bit too highland kitsch for me as we want a cooler vibe. Pigeon is a beautiful colour. Good luck. I would definitely paint it, and would suggest a good rub down (don’t scrimp on this) plus a good quality undercoat and then paint would look fantastic. The usual greige Farrow & Ball would look great. 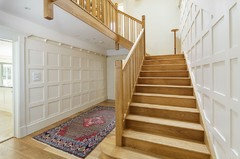 Search Houzz for panelled hall pictures for inspiration. Hi - I live in a 1930's semi which has oak panelling in the hall floor to picture rail height. 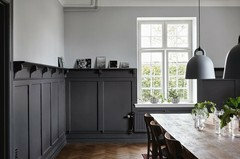 We have painted ours Farrow and Ball Manor House grey, looks fab. We lived with it as just the dark oak for many years but decided after much soul searching that something needed to be done to brighten it up. Our floor is also stripped oak but lighter, more golden colour. The floor now stands out against the painted panelling - so glad we took the plunge. Your dilemma remind me of the panelling at Blackwell arts and crafts house near Windermere. It has the most gorgeous wooden panelled halls and dining room which feel cosy but not dark. They have a wooden floor and panelling with a cream wall colour and then add colour with the soft furnishings in colours. The place gets a lot of visitors so should suit your needs. Maybe worth a look. Colours for a hall with black and white floor?